Yoga and mindfulness practices help generate health and happiness by incorporating principles of neuroscience, neuroplasticity, bi-directional body/mind communication and innate basic goodness. These evidence-based practices can help clients release trauma imprints, calm worried minds, soothe painful emotions, replace harmful thoughts, cultivate compassion, enhance concentration and teach the joys of present moment awareness. 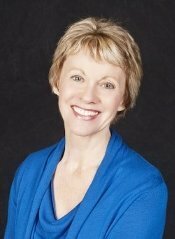 Mary’s teaching style is light-hearted and relevant to your work. Infused with practical, clinical examples and practices that you try on for yourself, this seminar focuses on how to integrate yoga and mindfulness as clinical resources in your day-to-day work. You will leave the seminar with a deeper understanding and skill set to apply for yourself and your clients. Multiple audio CD recording with electronic manual and instructions. 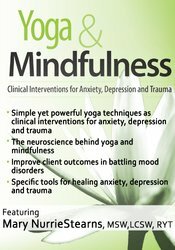 Teach simple yoga and mindfulness practices to your clients for better treatment outcomes. Incorporate breathing interventions/practices to help reduce anxiety and depression. Evaluate body awareness techniques that stabilize your client’s emotions. Teach clients self-compassion techniques to help regulate their emotions. Develop processes for reducing rumination and negative thinking with your clients. Analyze the neuroscience of anxiety, trauma and depression and how it impacts your clinical work. Nurses completing these self-study materials will earn 6.3 contact hours. Expires: 2/1/2022. PESI, Inc. is an AOTA Approved Provider of continuing education. Provider #: 3322. This self-study course qualifies for 6.0 self-study contact hours or .6 CEUs in the Category of Domain of OT and Occupational Therapy Process. The assignment of AOTA CEUs does not imply endorsement of specific course content, products, or clinical procedures by AOTA. Course Level: Intermediate. Expires: 2/1/2021. Canadian Occupational Therapists & Occupational Therapy Assistants: This self-study activity consists of 6.25 clock hours of instruction and may qualify for continuing professional education credit. Please save the course outline, the certificate of completion you receive from this activity and contact your state board or organization to determine specific filing requirements.